A play room to me is the place where my children can happily play and co – exist with each other in relative safety and meeting their own play needs (age appropriate etc) . We dedicated our carpeted formal living and dining room to this area years ago when we first became parents. Mainly because it was the only carpeted area in our house and also has such lovely windows looking out onto the yard surrounding our house and catches beautiful breezes. It’s a lovely place to be in and it has a really great “energy”. At the time of our first bubba we had all the baby toys in there surrounding our usual furniture but as he grew and became more active (and boy did he do that quick) we started minimising OUR contents and incorporating play areas to stimulate him like climbing toys , sensory areas , Tv etc . 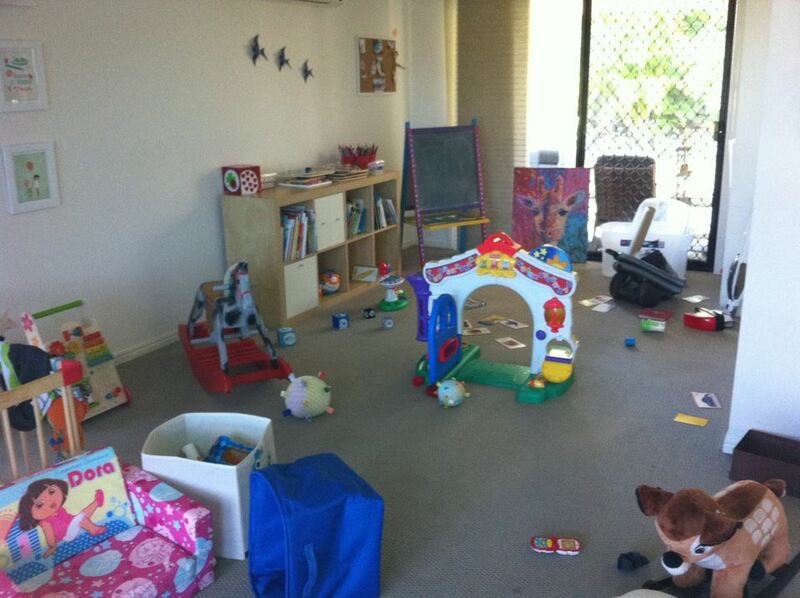 This became Sam’s play therapy environment, a place for him to feel safe and loved. Eventually over time we even relocated the main dining room to the tiled area . When we became a family of 4 , things became a little more complicated as Sam was into Lego and Bionicles, constructing and lots of teeny tiny anything’s that you don’t want to see a 6 month old chomping down on. Personally I’m not a big fan of toys in the bedroom for our kids because I want him to be a part of our living and day to day being ,this was especially important for our children who needed to learn to attach to us not be alone in their bedrooms. I also LOVE listening to what’s going on inside his brain which is very obvious when he starts his “battles “etc with his star wars lego characters (sisters are always high on the getting blown up and taken prisoner front , as is being counted to . That’s 1 , that’s 2 , that’s 3 , RIGHT, Darth Vadar off to jail for you !!! )..
Up until a few months ago my office was in this area of the house as well . See the previous blog on designing a play room. When we were lucky enough to acquire an in house babysitter to look after Sienna whilst I worked a few times a week and Sam started Prep , ours needs again changed and it was better that I be “locked away”in a room so I could actually get something done and have my own space. This brings us up tp the latest Playroom design. A more permanent answer to a lack of storage, too much crazy toy mess and a feeling of being smothered by STUFF!!! SO it was time to design another play area. A “safe”zone for Sam to do his homework , have his lego up high and his learning stuff away from prying baby fingers. Was a fun . safe , play environment stimulating the senses and imagination !! I decided on a full wall unit look that would be both a feature in the room and functional. 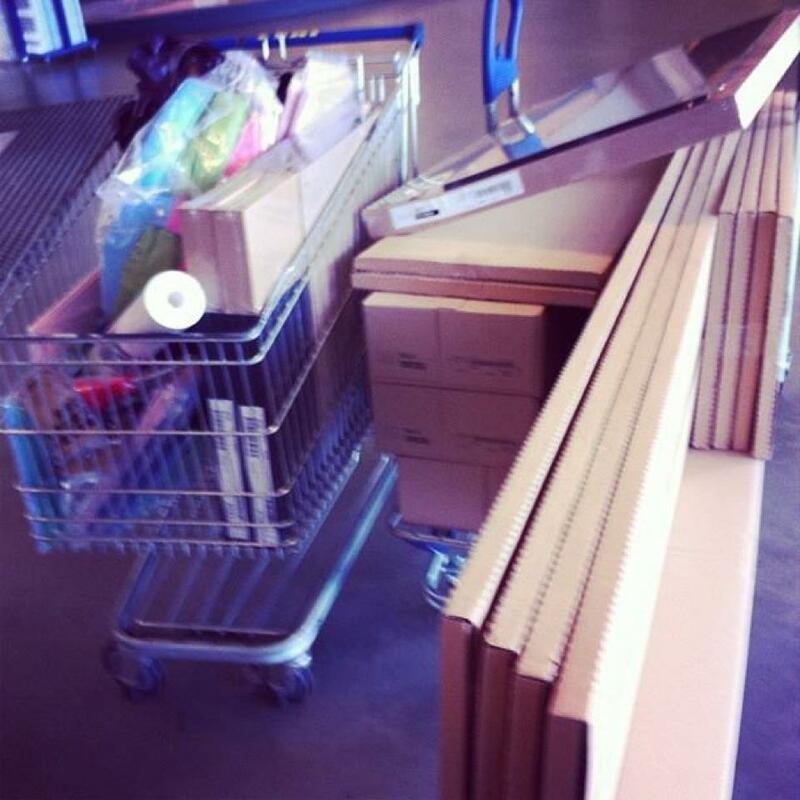 I’m a Billy Bookcase junky so after some measurements taken I headed to Ikea and purchased the crazy amount of stuff we needed (ok and some extra stuff too , but it WAS Ikea after all!!!) Ive listed the units etc that we purchased at the end. 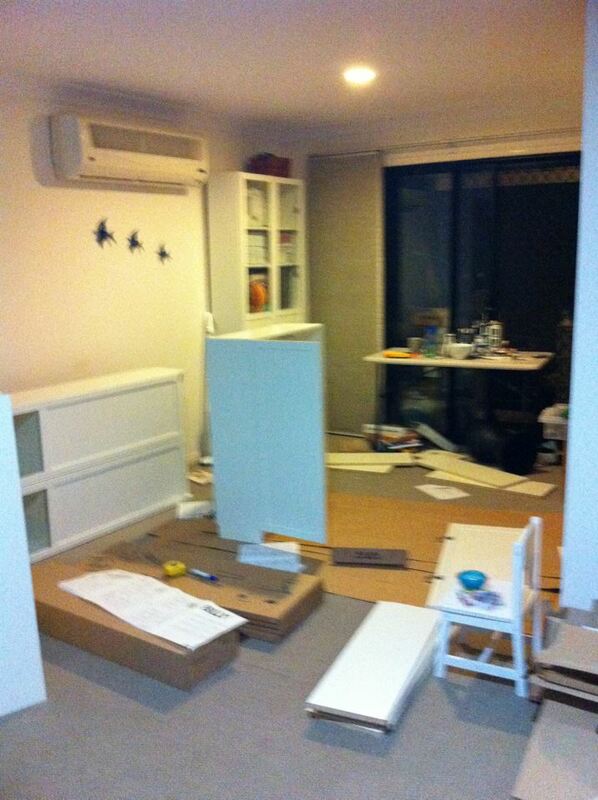 Funnily enough my husband was missing upon my return from Ikea so I started the process myself. Eventually when he returned we both got to it and 5 hours later it went from this .. It was relatively easy to put together just time consuming. But the effect was worth it in the end. Slowly I’ve been replacing all the kids toys and placing them in the cupboards . I’ve divided the larger cupboards into books and board games (either ends of the wall) The top is for displaying some items of importance such as the husbands Star wars toys (oops I mean collectibles) and for Sam’s more detailed Lego builds that we don’t play with every day . The room is like an L shape and one part is where Sam (5 ) can have all his delicate bits and pieces up high and safe from little sister. We have placed some cheap picnic tables there for him and he moves them around as he needs to access the area to suit his play or learning needs. He has his Sound words hanging from the roof that we are concentrating and other items up his end like the bits and pieces he cherishes all stored away safely in his Trofast system. He is a child that has a place for everything and needs everything in its “place” so this sysem suits him perfectly. The remainder of his toy sets like cars , construction / building items are safely stored away in clear boxes where he can get them out and play with them and then return them when he finished so the dreaded sister doesn’t munch on them . The remainder of the area is really a free spac for both kids but is especially safe for Miss Sienna (1) to roam around and play. Ive started rotating items form the cupboards each few days so the toys are fresh and new and Ive been storing them in the 6 Cube Storage unit (safely fastened to the wall) . She can open and shut the doors and thinks its great ! On the wall in that area there is a play table that I put something different on each day aimed at both kids (like a puzzle for Sienna and a etch a sketch for sam) or a sensory box for both to look at etc. This is also the wall that has our Family of LOVE wall. Each picture was picked by Sam of our family and reminds us that we are all one family who love each other . There is also a painting from when he was a tiny bub the first Christmas and I did some painting with him. He love sthis painting and it makes some great artwork ! There is a picture missing that was smashed the day before when I was moving the furniture but we have put the space aside for when we get some professional pics done. Moving along you can see where I still have our soft toy holders. I made these really easily and you can see how I in my previous designing a playroom blog . Finally I've dedicated a wall to Sam and what we are working on with him at that time. Currently we are working through feelings and intensity of feelings. Teaching to regulate and how to think green thoughts rather than red thoughts. I bought a cheap frame and spray painted it and we have any featured worksheets or current “tool Kits” that we are using in conjunction with the school or psychologist , speech therapist etc. I plan on hacking the billy system and adding some wallpaper to the back of the bookshelves to make them Pop even more. So I’m currently sourcing some ideas on this. The thing I love most about this room is that we are all now congregating in it playing family fun games , hanging out on the floor , working on laptops etc. Its actually my favourite room in the house and it has encouraged us all to hang out and play together or even just chill together. And really what’s more important than being together?? So that’s basically it. Feel free to post any questions either on here or on our facebook page www.facebook.com.au/limetreekids and Ill do my best to answer.